BLT, or Bacon, Lettuce and Tomato, commonly refers to a sandwich. This week, I made a BLT, but with spaghetti instead of bread. Get your spaghetti or other kinda of pasta cooking in a pot of well-salted boiling water. Save a bit of the pasta water, and drain when al dente. Slow-cook chunky slices of tomatoes with some butter on a skillet, letting them soften to a pulp. Pinch out and discard the skin at the end. Soak a couple of rashers in water for a couple of minutes; this is so that the dish will not be overwhelmed by the flavour of bacon. Fry the rashers till cooked but not shrivelled. It can be tempting to blaze them to a crisp. Resist. Meanwhile, wash and cut your lettuce to fork-full pieces. When the tomatoes are done, toss in the drained spaghetti, and splash a bit of that pasta water you saved earlier. Season lightly with sea salt and freshly ground black pepper, and a small dollop of mayonnaise. 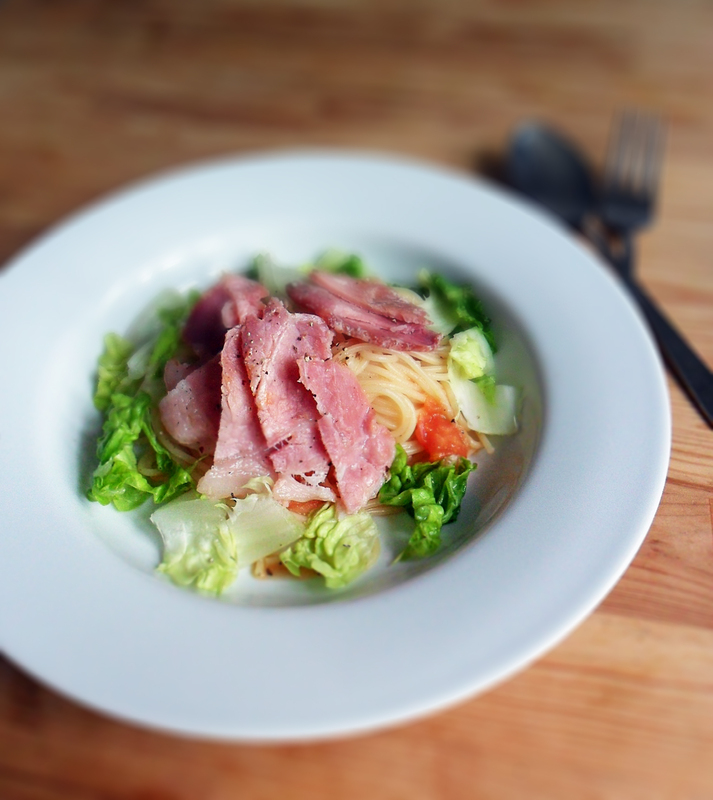 Turn off the heat and mix in the lettuce briefly, and serve, with the rashers of bacon, sliced. 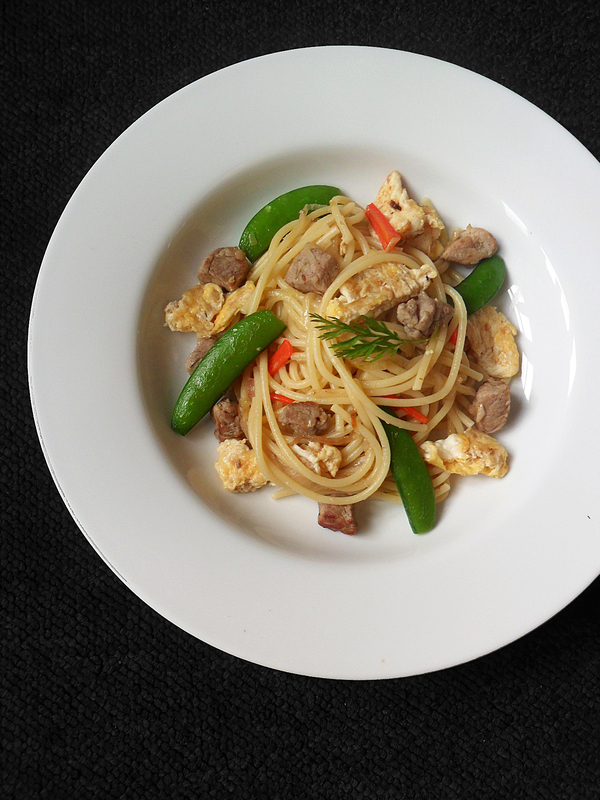 Asian-fried spaghetti of pork cubes, sugar snaps and egg, with cumin, oregano and chilli. The usual drill. Set the pasta away to boil in a pot. In a hot skillet and a little oil, fry minced garlic till fragrant. Toss in pork cubes and sugar snaps. Add in crushed cumin and oregano. When pork is almost done, move all to the side of the skillet. Add some oil in the pan and crack in an egg. Beat it erratically and let it cook in chunks. Mix everything together and season well with freshly ground sea salt and black pepper. The pasta should be done by now. Drain and add to skillet. Stir everything together into a party of lovely colours. 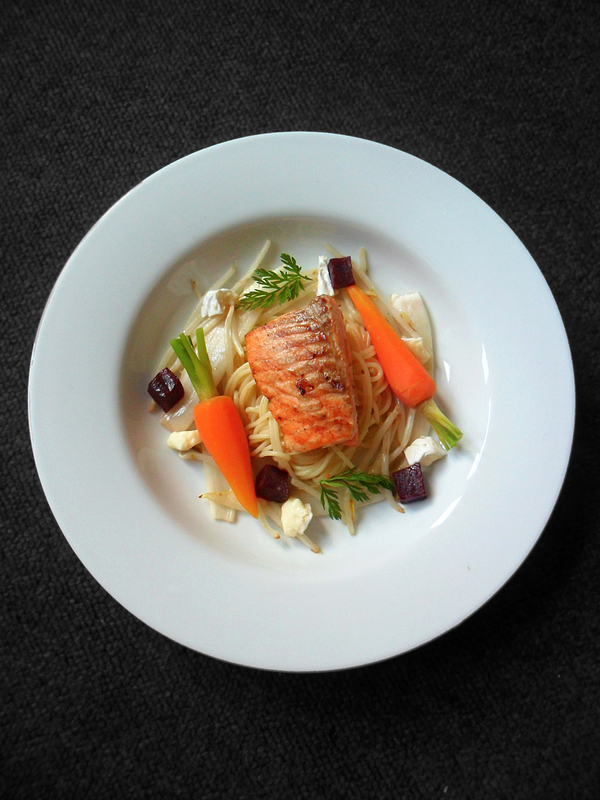 Lemon salmon on oregano spaghetti with boiled carrots, blanched chicory and beansprouts, with beetroot and Brie. Set the pasta to boil and drain when done. Season with sea-salt. Then toss with a good lug of extra virgin olive oil and dried oregano leaves. Sear the fillet of salmon with a generous squeeze of lemon juice, till lovely and browned. Serve with beetroot cubes and pinches of Brie. Don’t those carrots look lovely? 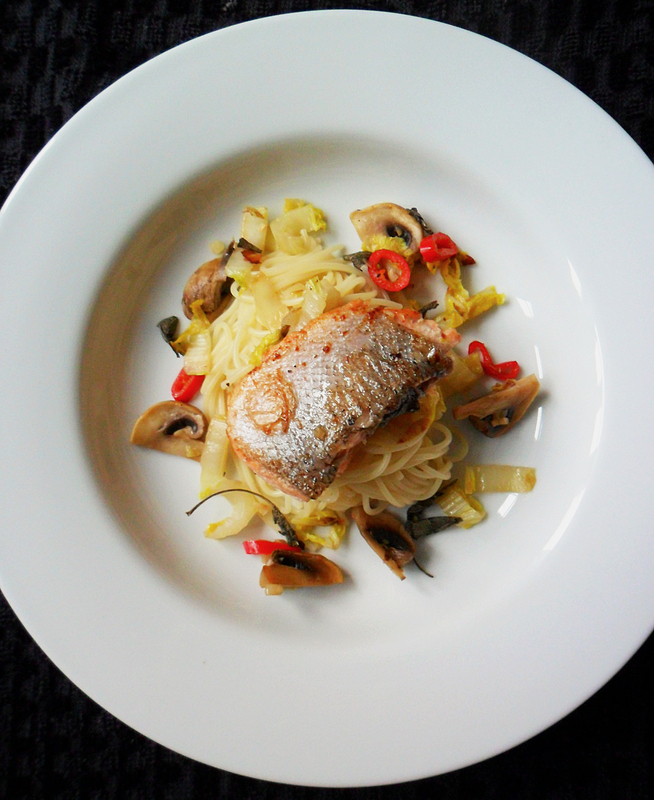 Seared fillet of salmon on pasta with Chinese leaf, mushrooms, chilli and dried sage. Set pasta away to cook in a pot of salty boiling water. In a pan with a little bit of oil, sear the fillet of fish skin side down till just done. Set aside to rest. In the same pan, toss in minced garlic and fry till fragrant. Add in shredded Chinese leaf and quartered mushrooms. Crush in dried sage leaves and season well with freshly ground sea salt and black pepper. Add sliced chilli when vegetables and mushrooms are almost cooked. Drain spaghetti and mix together with the Chinese leaf and mushrooms well. Add a generous lug of good extra virgin olive oil to loosen everything up nice and smooth. Plate up and serve, boasting the skin of the salmon in its crisp golden glory. It’s absolute melt-in-your-mouth heaven to indulge in a large nugget of fatty salmon meat, pan-seared to perfection and luxuriously devoured whole. Frozen fish is an sufficient alternative if you haven’t got fresh fish. However, cooking frozen fish can be a tricky task; when done wrongly, the fish can be real dry, and gross. A good way to do it I’d say, is to baste it continuously in the accompanying sauce. Set the pasta away in a pot to boil together with a handful of frozen peas. Boiling the peas instead of sauteing them allows them a fresher flavour and sweeter crunch. I made the sauce by tossing the chopped condiments (mentioned above) together into a skillet, and adding a teaspoon of tom yum paste and an adequate amount of pasta-cooking water. Then, I cooked the fish, drenching it repeatedly in the sweet yet just sourish gravy. Nonstop, till the fish was just right. Drained the pasta and peas and served with a chilli garnish, for colour and added heat. 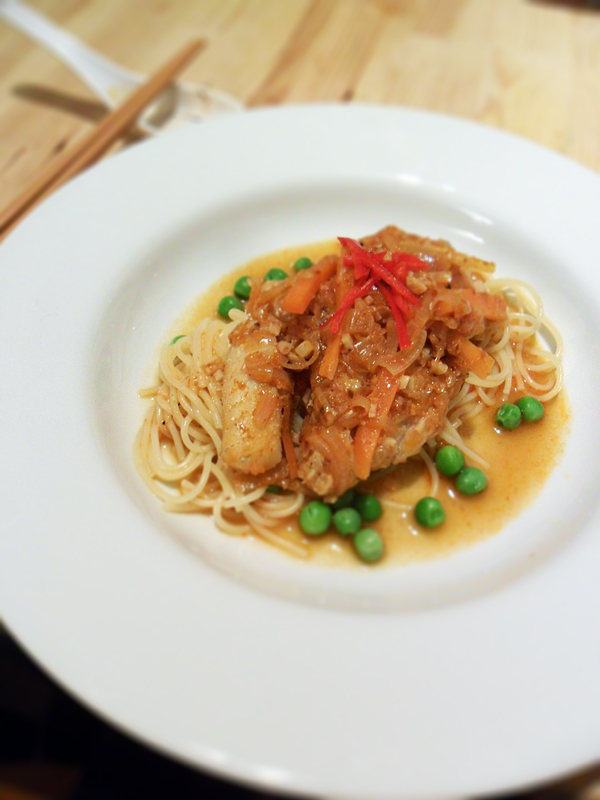 Kinda like an Asian bolognese, slightly spicy, and with fish. Lush. 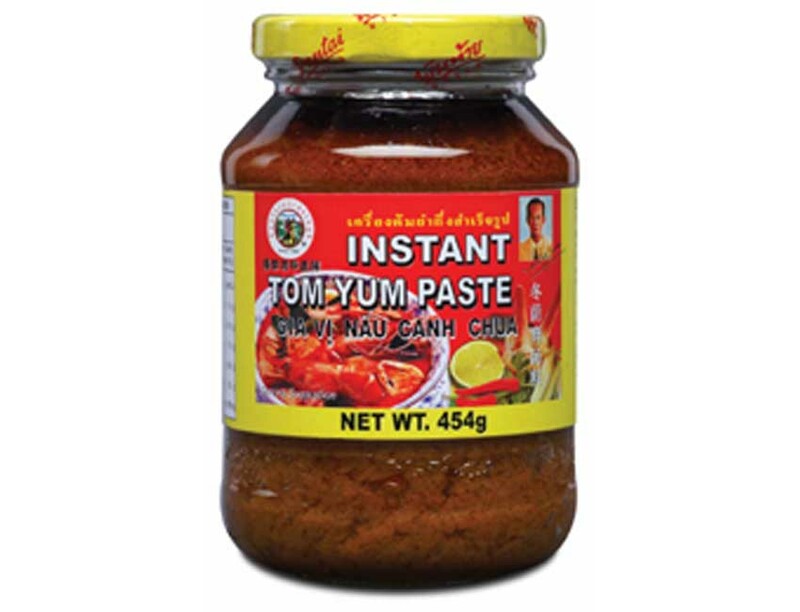 Click here for the original Tom Yum Spaghetti recipe. Well, this not for the faint-hearted; it’s incredibly extravagant and unforgivably heart-stopping. 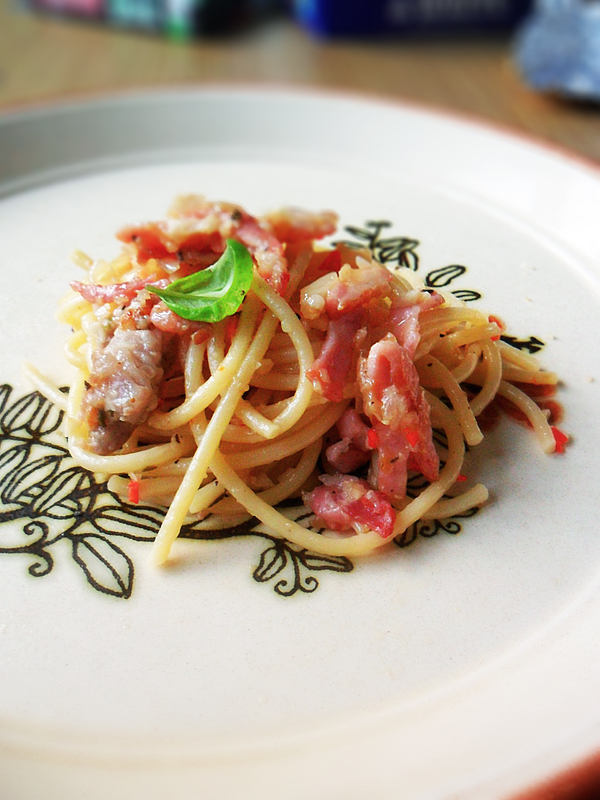 Out from the fat rendered from bacon, an Aglio Olio dish is born. Same old drill: Set your pasta boiling away in a pot. Using a small knob of butter, get the bacon into a skillet. Render the fat out before tossing in a generous amount of minced garlic, chilli, dried basil and oregano. Toss in sliced pork, which has been marinated with salt and pepper. When the pasta is done, drain and add to the skillet. Toss about, coating every strand of spaghetti well. Grate Parmesan or Cheddar directly on and mix throughly. Alright, so maybe it’s not really cream. But it’s pretty close I reckon, and less heartstopping, I think. 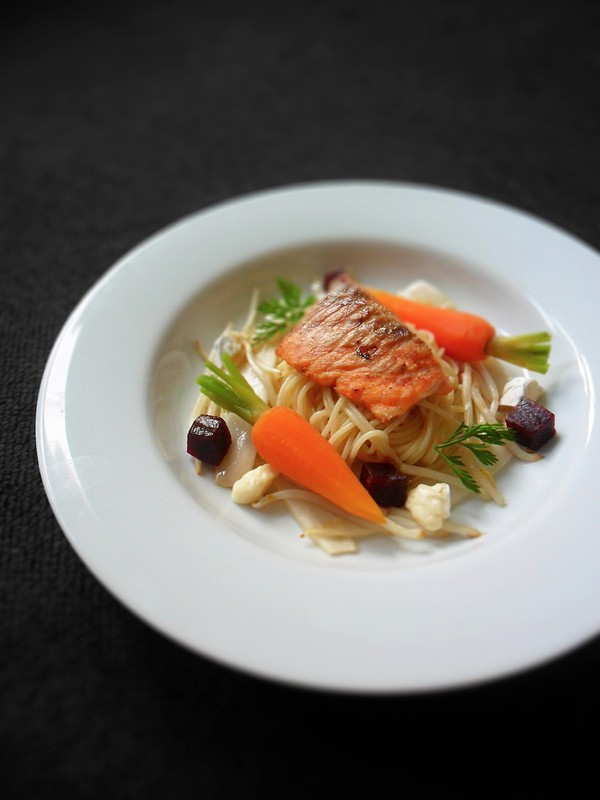 Get your quick-cook spaghetti boiling together with the chopped carrots in a pot on the hob. In a skillet on medium low heat, melt a hunk of butter, then add in a splash of wine, a squeeze of lemon, a small amount of garlic puree and a thin slice of ginger. Crack in some salt and pepper too. Make sure you’ve got enough liquid to baste the fish. Once everything has combined, remove the slice of ginger, it has done its job. Make sure the fillet of fish has been pat dry, gently place it in the pan and baste it away on medium heat. Remove as soon as the fish is cooked. Take care not overdo it. Drain your spaghetti if it’s done. With the remaining butter and fish liquid rendered, add equal volumes of milk and flour. TIP! Usually, I add the milk to determine the amount of sauce I want, then add a little more milk, before adding flour in small quantities till the desired consistency. Taste the sauce and adjust the seasoning accordingly. Squeeze more lemon juice if necessary. 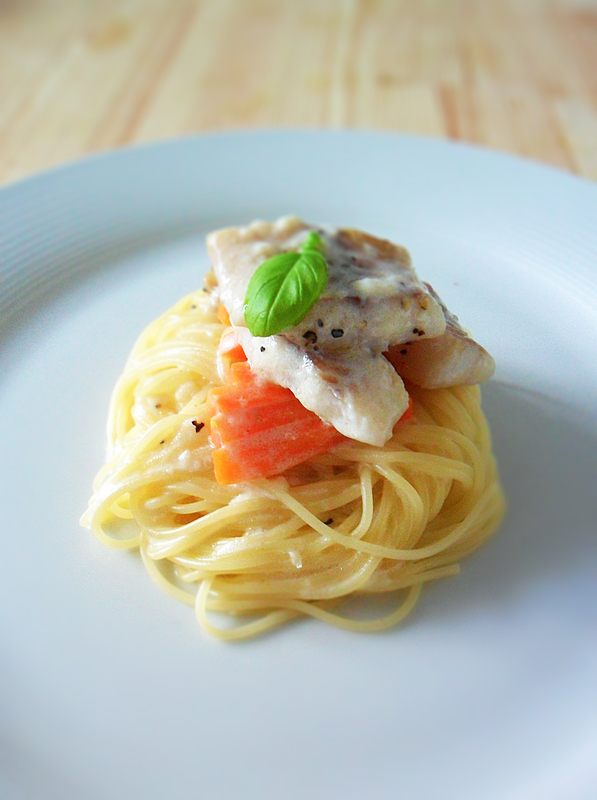 Serve the sauce drizzled over the fish and spaghetti.